Elephants, Donkeys and Fear - Oh My! I decided to early vote yesterday to avoid the crowds on November 4. 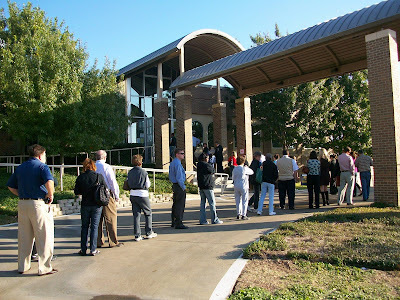 When I drove up to the church in my neighborhood to vote, the line was around the block. At least 100 people waiting in line - at 2:45 pm in the afternoon! Crazy. So I drove back to the office. According to many news reports, early voters have turned out in record numbers this year. From what I can gather, it's looking good for Obama. But I wouldn't count McCain out. He's always been the underdog and it ain't over, till it's over. I went back this morning and here's what it looked like at 9:00 am. When I got there, there were about 20 people ahead of me. Took about 10 minutes to get in. Not bad. When I walked out, 20 minutes later, the line looked like this. I heard one of the volunteers say that between 8:30 and 9:30 was the best time to come and then it was crazy all day. So, I got lucky. And now it's done. I don't feel good about my vote. I have concerns about both candidates and can't say I'm happy with the outcome either way. But I didn't want to not vote in what is a very important election. So, I picked the lesser of two evils. Sigh.